The Ogino family is on the way to their new home, and ten-year-old Chihiro is sulking in the back seat, upset at having to leave her old school. Her father takes a wrong turn and they find themselves in what seems to be an abandoned theme park. While exploring the place, Chihiro’s parents come across an unattended stall full of food and they begin to help themselves to the food, saying that they will pay the bill when the owner returns. Chihiro, who has had a foreboding feeling from the outset, leaves them there to continue exploring on her own. She finds a bathhouse, but there she meets a strange boy who warns her away from the place and tells her to leave as night is falling. Chihiro discovers that her parents have turned into pigs and that she is in the middle of the spirit world. The confused and terrified Chihiro is later found by the boy, whose name is Haku. He tells her she has to work in that world, or be condemned to fate as a pig. But to work, she has to strike a deal with the mistress of the bathhouse, Yubaba. 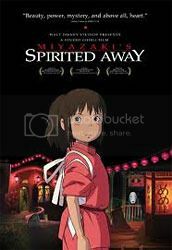 I’d always heard that Spirited Away – or Sen to Chihiro no Kamikakushi1, to give it its Japanese title – was great (it won Best Animated Feature at the 75th Academy Awards, amongst other awards) but never quite believed it somehow. I was wrong. So wrong. The story is easy to understand without being shallow; there are so many themes woven into it. At the most basic level, it is a moralistic tale; it is a story about a sullen, spoilt little girl who learns to overcome adversity and becomes a better person for it – a “coming of age” story. But it is also a story of friendship and loyalty and kindness, a story about identity and belonging. One could add that it’s also a story of young love, but I prefer to read that aspect as being an extra bit and really not the main point. And oh, the details! I simply revel in the details of this movie. It is very much a Japanese movie and the details say it all – the abandoned theme park (apparently there are quite a number of such places in Japan), the public bathhouse, the politeness that is so much the focus when Chihiro first joins the bathhouse, the engacho2, the river dragon spirits3, and so on. The manner of speech of various characters also throws hints about their personalities or roles – for example, Haku speaks in a formal, almost courtly way; Chihiro’s speech is that of a regular Japanese child. The character names alone are a joy to look into, which is no surprise since identity is a strong theme in the film. For instance, there’s Yubaba, whose name translates directly to “bathhouse witch/hag”, and Zeniba, her elder twin sister whose name also means the same thing – the first characters of their names (銭 and 湯) put together are the word for “bathhouse”4 – which points to how both sisters are rather like two sides of the same coin. Kamajii is made up of the words for “boiler room” and “old man” – and Kamajii works the boiler room of the bathhouse. Yubaba’s young son is called Bou, and that can be a casual way of addressing a young boy. A look at the kanji in a dictionary shows that it can also refer to a monk, which is in keeping with the spiritual aspect of the story, and perhaps also a nod at the kid’s lack of hair (haha). Haku states that his full name is Nigihayami Kohaku Nushi, and the last part – nushi – is a term that indicates a guardian spirit5, and so I’m guessing that it would really be “Nigihayami, the Kohaku (River) Guardian”. The English dub completely loses the nuance of Haku’s name; he only says his name is the “Kohaku River”, which is quite different and much less fascinating. Clearly a whole lot of thought went into the names. The story was paced well, with a good mixture of fast-paced action and quieter scenes. I find that quieter scenes are Ghibli’s specialty. For instance, the dialogue-less sequence where Chihiro and her three companions get on the train to go see Zeniba – you’ll see very few such scenes in other animated features. They just sit there on the train in silence, and the ghostly figures around them are silent too. There’s a feeling of loneliness and strangeness in that scene that is simply begging people to discuss the meaning behind it, if there’s any (and I’m sure some have already done so). Nothing happens, it doesn’t necessarily advance the story. In a standard film editing class one would very likely be told to cut out such scenes, and in most cases such scenes should be cut. If done wrongly, it would be really boring and pointless. But this… it is kind of pointless, maybe, but not boring. I can’t say I particularly care for the character designs. I’ve never thought character design to be Japan’s strong suit. Sometimes you find artists who do it well – Oda Eiichiro of my favourite manga, One Piece, is one of those – but most of them tend to be relatively generic. However, the backgrounds are beautiful. This is true of all Studio Ghibli films. They do beautiful painted backgrounds that are delicate and storybook-like, and I do so love that. If I had watched this movie five years ago, I probably wouldn’t have liked it half as much. Even knowing what I do, I still had to read up quite a bit to flesh out the little skeletal bits of what I knew. But I comprehended and saw enough in it that I just fell in love with the movie. I would highly recommend it to just about anyone. Five stars from me! 2 Engacho – It’s a Japanese children’s ritual where, if one steps on something gross, the other says, “Engacho!”. The former makes a circle with his thumbs and index fingers, and the latter breaks the circle with a chopping hand motion. It’s supposed to break the spell/curse and purify the dirt, kind of. 3 River dragon spirits – This isn’t particularly “Japanese” – even according to Chinese legend, dragons are connected to water, rain and rivers. But it’s still very much an Asian thing. 4 Together the two characters 銭湯 are sentou (bathhouse), but apart, the first character can be read as zeni, meaning money; the second character can be read as yu, meaning hot water or hot bath. 5 Nushi has other meanings, including “head/leader (of a household, etc. )”, the “owner”, and the “subject (of a rumour)”.